Does your back get fatigue or tight from sitting for long periods of time? Are you looking for relief while sitting at your desk? Well look no more! The memory foam lumbar back support by Easy Posture is guaranteed to give you the support that you need. There are many back cushions on the market, but none come close to Easy Posture. Order Now by Clicking the Add to Cart button at the top of this page. Your back should not have to suffer! NEW & IMPROVED DESIGN! PROVIDES GREAT BACK SUPPORT FOR CHAIRS - and PAIN RELIEF from sitting in a desk chair or driving for long periods in an uncomfortable car seat; helps to relieve lower back strain. No need to replace your office chair! Our Easy Posture Memory Foam lumbar cushion is designed to help you reduce back pressure by evenly redistributing your body weight, soothe pressure points, and provide maximum spinal support and comfort. 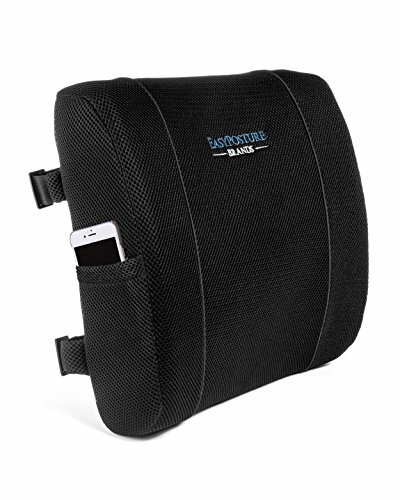 BEST ERGONOMIC BACK PILLOW - to promote good posture and help relieve back stress from conditions such as acute or chronic lower back pain, aching pains from pregnancy, degenerative disc disease, herniated disk, scoliosis, or sciatica pain. ADJUSTABLE DOUBLE STRAPS: Designed to fit various sized chairs. The double straps help to prevent slippage and keep your cushion in place. BREATHABLE MESH SUPPORT - of top quality fabric to provide greater air flow for comfortable use and prevent your back from sweating or feeling hot. Well made and of great quality. WHAT OUR CUSTOMERS SAY - "I am no longer one of those people that leave my office job hunched over. I bought this for my work chair and almost instantly felt more comfortable. The first day I put this on my chair I felt a difference and a few weeks into it I am just as pleased as I was the first few days."